Sold by Metals shop and Fulfilled by Amazon. Gift-wrap available. 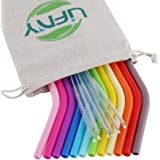 Amazon's Choice for "silicone straws"
🍹 【Silicone Straws Bundle】: Every time you purchase the reusable silicone straws bundle, you will get 8pcs big silicone straws (About 10 length/outer diameter 0.46”/ inner diameter 0.35”) +4 cleaning brushes+ 1 red storage pouch. 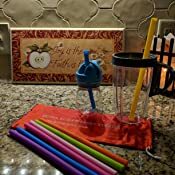 🍹 【Silicone Straws for Yeti/Ozark/Rtic and Any Other Tumblers】: Every time you crave smoothie juices or any tasty drinks in your kitchen, just feel free to use our Mcool drinking straws. Just remember to wash them carefully using dish soap before the first use. You can use the cleaning brushes and also dishwasher is safe. 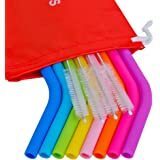 🍹 【Silicone Straws BPA Free】: This package includes 8pcs wide colorful silicone straws. 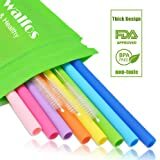 The silicone straws are made of natural food grade silicone which is safe for children. 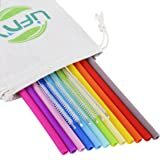 🍹 【Reusable Straws With 5 year Warranty】: If you have the slightest problem with your product, give us a message and we will send you a new one right away without any cost on your side. Just order now! 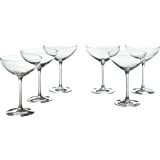 Sold by Metals shop and ships from Amazon Fulfillment. Sold by Juju Accessories and ships from Amazon Fulfillment. 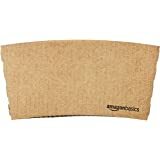 Sold by Flathead Products and ships from Amazon Fulfillment. 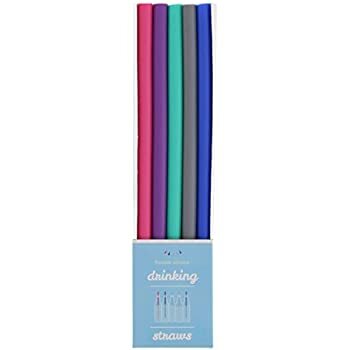 The MCOOL silicone reusable drinking straws are perfect for everyday use and for entertaining. 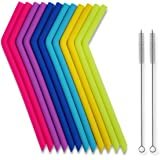 The silicone straws are made of food grade silicone. 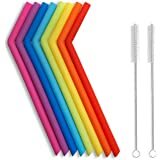 8Pcs 10” long 0.45” wide silicone straws which are perfect for Smoothies. Mcool gurantee the quality for 5 years. We will return all the money to you if you are not satisfied with our quality. Bending silicone shows whether or not it's actually just made out of silicone. When pure silicone bends, it won't change color. When there's other components added as filler, it'll turn white. The purple and pink straws pictured are from my order. The little black straw tip is for reference to show what it looks like when you bend real silicone. Also, they include a direct email address in the pouch to contact for refunds, so I wonder how many people who notice these aren't 100% silicone actually make it to Amazon to mention that they weren't satisfied with their purchase? Hmm. I was looking for silicone straws, so these aren't for me. 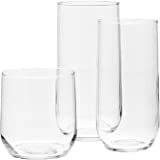 I bought these to replace the acrylic straws we were using in my toddler's tumblers but they are too wide. I love the soft silicone for the fact that he can't break them the way he was breaking the acrylic straws and my eight-month-old can chew on them as well. I like the larger size for the fact that they are good for thicker liquids as well as keeping you from sucking too hard and causing age lines in the upper lip. The only con besides the fact that it won't fit inside tumbler cups is that both ends were completely flat making it hard to keep a continuous flow, so I've included a picture showing the end that I cut at an angle and now there's no stop in the flow. 4.0 out of 5 starsFun colors, and nice to have 4 cleaning brushes too! Nice to have these straws, to avoid having to add another plastic straw to trash/recycle. 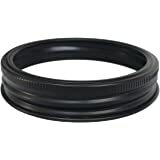 The outside diameter is about 11 mm, and the inside diameter about 9 mm which makes it great for smoothies. This is from eyeballing it with a mm ruler; I didn't use a precision gauge ;) The flexibility of the straws allow it to fit most of my reusable cups. I do have to squish this straw to fit my Tervis lid with the "slide type" closure. 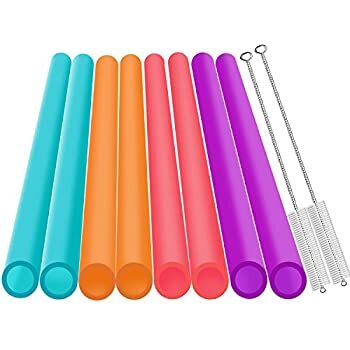 While these do work, and I will keep them, I still would like to get a slightly smaller diameter silicone straw - (maybe 9 mm outside diameter and 7mm inside diameter) and a bit longer than these.The length of these straws is just under 10 inches; mine measure 9.75 inches long. I wish they were a little longer, maybe 10-10.25 inches long. These had a distinctive taste and odor. Really weird. I arranged a return to Amazon and requested to actually send them in so they could observe the smell/taste issue. 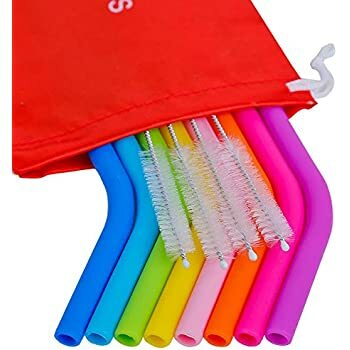 I purchased another set of silicone straws (same seller - different brand) that were great. I am doubtful that these are food grade silicone as stated. 2.0 out of 5 starsNot what I was hoping for. I am glad that they’re made out of silicone and bend with ease. 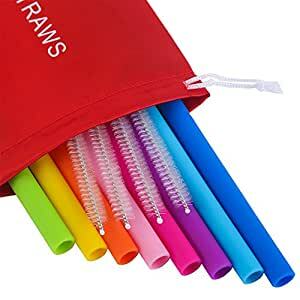 What I am not happy with is that they have Seams That run the links of the straw and get irritates my lips when you drink from them. 5.0 out of 5 starsMy kids love'em My wife loves 'em and she's hard to please! Great product. I use raw eggs as my protein fat base in some of my smoothies. This can dry hard. Remember to rinse or drink water with it if at gym. This will keep inside of the straw clean and the cleaning brush does the rest. 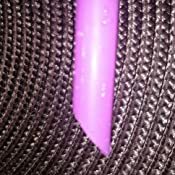 Insert brush on one end then the other to clean well when home. Also if a tall glass of ice is used just insert straw first before adding ice (straw is durable but soft). 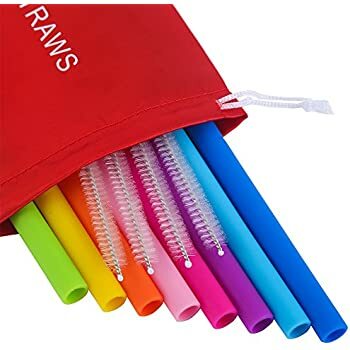 These straws are good quality and are perfect for thick smoothies. 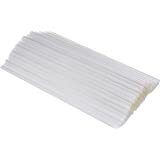 Though they are not quite as flexible as smoothie straws I purchased in the past, they are half the price of those straws, and also come with for cleaning brushes...a must for keeping bacteria free. 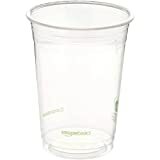 In the photo, I show one that I shortened for my granddaughter's smoothie cup. 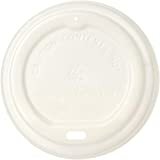 Though it wasn't easy to thread through the lid, it was so able, and keeps her from making a mess. It also for through the opening in a Tervis tumbler lid.